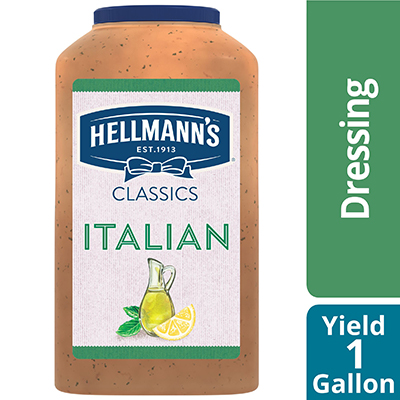 Combining garlic, herb, and acid notes with a hint of sweetness, Hellmann's Italian Salad Dressing makes a versatile addition to any commercial kitchen. This gluten-free Italian dressing is made with real, simple ingredients that your guests can trust, and it contains no high fructose corn syrup, artificial colors or artificial flavors. With a lightly emulsified vinaigrette texture, the dressing has a premium mouth feel. Certain to please even your most discerning patrons, this dressing works beautifully drizzled over delicate greens or used as an ingredient in a marinade. Hellmann's Zesty Italian is made with Romano cheese, Garlic, and Red and Green Bell Peppers and has no artificial flavors. It's Gluten-Free and has 0g Trans Fat. Hellmann's brand is recognized throughout the world for unrivaled quality and flavor and its commitment to real, simple ingredients, like Romano cheese. Hellmann's Zesty Italian is great for green salads, bound salads, as a marinade, on vegetables, as a dip, sandwich sauce and more.